Packing and storing food is fun and simple with Dobi's disposable Take-out pans. The pans are disposable and recyclable and serve great when you want to fix a to-go plate. The lids top side is white paper coated so you can easily label the box contents or write heating instructions. 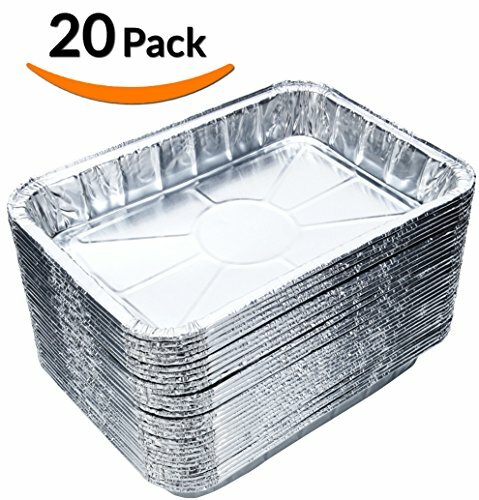 DURABLE ALUMINUM FOIL PANS - Sturdy pans! Great for baking, cooking, roasting or heating in the toaster oven. IDEALLY SIZED TO FIT ALMOST ALL TOASTER OVENS - The pans dimensions are 8 1/2" x 6" x 1 1/4", perfect for healthy single serving yet compact enough to fit in small-to-standard sized toaster ovens. NO CLEAN UP! Just throw away once finished. SAVE TIME AND MONEY - Buy in bulk and never scrub a pan again! Keeping your toaster oven clean has never been easier.